Connect Conference is the industry leading solution for planning, communications, and collecting competitive and scientific information at major conferences. Our mobile app and cloud-based technology provides real-time, automatic reporting of your team’s coverage of sessions at conferences which is made available through a secure web portal and can be downloaded as a PDF, Excel, or PowerPoint document. This allows you to share up-to-date critical information with your team while on-site at the meeting, rather than weeks later. The Connect Insights program allows you to see, in real-time, what KOLs are thinking about the data being presented at medical meetings on your product or a competitor’s product. When deployed to Key Opinion Leaders (KOLs) at medical meetings, the Connect Insights mobile app technology and reporting platform is able to collect real-time data that includes insights, comments and sentiment analysis from the experts that matter the most to your brand and market. 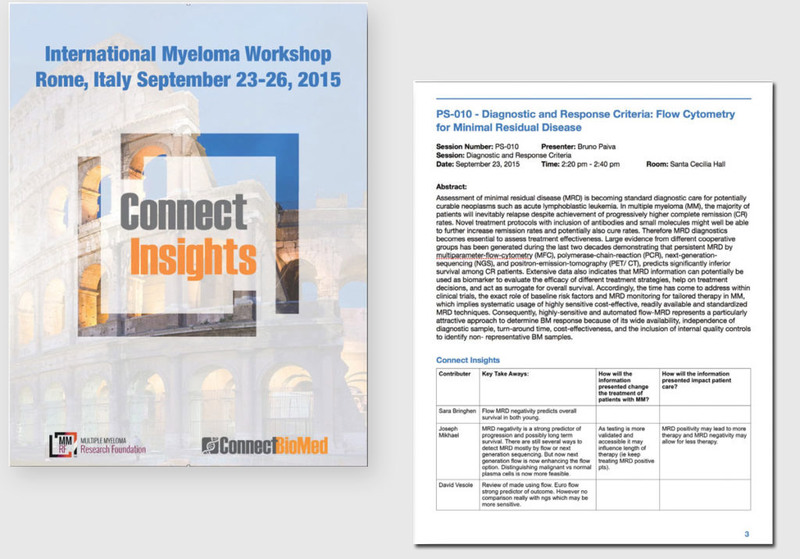 At a major multiple myeloma conference, we collected over 320 comments from 15 Experts/Key Opinion Leaders (KOLs) on more than 45 sessions. PosterTalks is the latest innovation in mobile technology to enhance and facilitate the meeting experience. PosterTalks’ web-based platform significantly enhances the poster viewing experience at medical meetings. PosterTalks provides presenting authors with a simple web-based interface to record dynamic audio and video presentations. Meeting attendees can to view these presentations, download or bookmark their favorite presentations, download PDF versions of the posters, ask questions, leave comments, and share presentations with their colleagues all from the convenience of a smart phone.